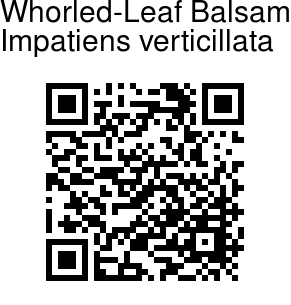 Whorled-Leaf Balsam is a perennial herb or undershrub up to 2 ft tall, with stems branching in lower half, swollen at joints. Leaves are arranged oppositely or in whorls of 3-6, elliptic or elliptic-lanceshaped, tapering, rounded toothed-serrulate along margins, 6-12 x 1.2-2.2 cm; leaf-stalks 0.5 - 1.5 cm long. Flowers are borne in 3-to many-flowered umbel-like clusters, scarlet-red or orange. Flower-cluster-stalks are up to 4 cm long; flower-stalks 0.7-2 cm long. Lateral sepals are linear-lanceshaped, 0.8-1 cm long. Lip is boat-shaped; spur slender, curved, 2.5-3.5 cm long. Standard is hoodlike, about 1 x 1.2 cm. Wings are bilobed, clawed, up to 2.8 cm long; lobes oblong-obovate, with hairs on dorsal keels. Capsules are spindle-shaped, 0.8-1.2 cm long, many-seeded; seeds 2.5 mm long, brown, hairy at pointed end. 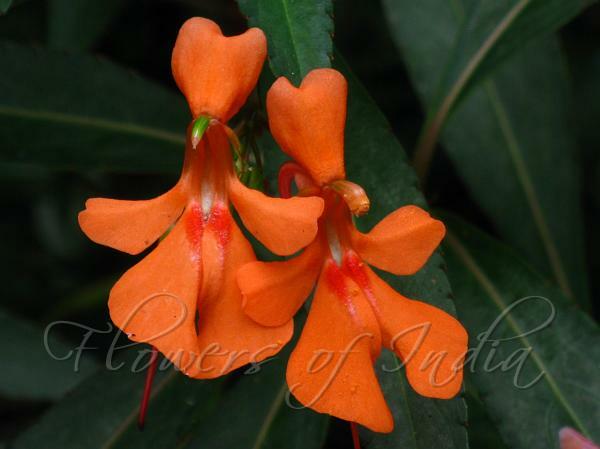 Whorled-Leaf Balsam is endemic to Southern W. Ghats, found in gravelly beds near streams between 900-1500 m, in Tamil Nadu and Kerala. Flowering: September-April. Identification credit: Shrishail Kulloli, A G Pandurangan Photographed in Kallar Valley, Kerala.